To maintain the validity of the certificate, CCS-classed ships are subject to surveys in accordance with the requirements of classification rules. These surveys mainly include special survey, intermediate survey, annual survey, docking survey, propeller shaft and stern tube shaft surveys, boiler survey, continuous survey, occasional survey, alteration or conversion survey, etc. In the meantime, ships are subject to various statutory surveys according to applicable conventions and the flag state regulations. 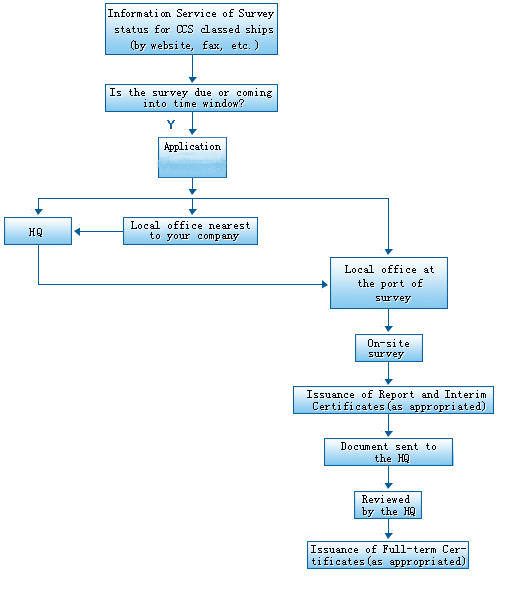 If the above surveys are to be performed in areas where CCS branches/offices are located, shipowners/ship management companies can submit the application directly to the branches/offices. They should usually use the specified “Application For Surveys Of Ship In Service” . The survey branch/office will arrange relevant surveys after application review. In areas where CCS has no branches/offices, shipowners/ship management companies can apply to the Classification Dept. in the Head Office, which will appoint surveyors or entrust other societies to perform surveys according to the actual situation.